Today’s entry consists of several miscellaneous items dealing with food in Buenos Aires, money in Tierra del Fuego, and my own social media presence (about which there may be even greater new in the near future). All will be significant in upcoming austral summer. There’s some more information on the burgeoning Peruvian cuisine scene in Buenos Aires where, according to a friend of mine, the new “Astrid & Gastón” that I mentioned in a recent post is not quite it seemed to be. In fact, it appears, it’s the “former kitchen/management team off on their own,” to the apparent displeasure of Gastón Acurio, who’s a brand in his own right, and they’ve had to shut down at least temporarily. Pictured above at last year’s Feria Internacional de Turismo, they may well have to reopen under another name. While closing the Buenos Aires branch of A&G, Acurio will open a new branch of La Mar in Palermo, in February. 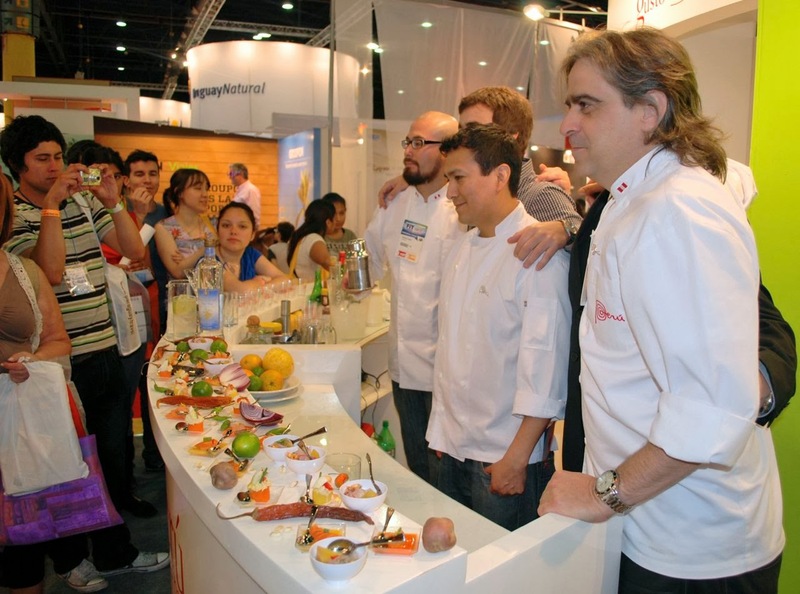 However the other situation sorts itself out, that should be worth a visit for Buenos Aires-bound travelers who, until now, have had to go to Lima, Santiago, São Paulo, Mexico City, Panama or San Francisco to taste his Peruvian seafood specialties. Since last week, when I wrote about the informal exchange market in Patagonia, I’ve had an email exchange with another friend who operates a B&B in Ushuaia. Confirming my supposition that the cruise ship trade has brought a relative abundance of dollars there, he says the local market is less robust than that of Buenos Aires (where the dollar buys nearly 10 pesos). Local businesses, he says, “use the official rate or at most they’ll pay seven or eight pesos per dollar. If you are lucky you’ll find someone that can pay a bit more.” Patagonia-bound travelers should try to change their dollars in Buenos Aires, if time permits. While I’m at it, I’ll issue a reminder that I now have a Facebook account, which I use primarily for photography, and a Twitter account, in which I pass on the latest news on Argentina, Chile, the Falkland Islands and even wander a little farther afield. Please feel free to like/follow me at those sites.